Chapman Tripp solicitor Althea Carbon was announced as the winner of the Emerging Leader award at the 2014 Women of Influence Awards last week. The 25-year-old was one of just two lawyers to be recognised at the ceremony, and was among a handful of hugely-respected New Zealanders who were also announced as winners. Carbon told NZ Lawyer that it was an honour and a privilege to even be a finalist in the category, let alone the winner. She was inspired to hear about all the ways in which the women that were acknowledged at the awards were making their marks on society. Other winners included Lesley Elliot, the founder of the Sophie Elliot Foundation, an organisation that aims to prevent violence against women through education and empowerment, set up in memory of her daughter who was brutally murdered; lawyer Jo-anne Wilkinson, the co-founder and recently retired executive director of the Foundation for Youth Development, which she started alongside her husband, Kiwi mountaineer Graeme Dingle; and Dame Wendy Pye, the founding owner and managing director of educational publisher, Wendy Pye Publishing Ltd. 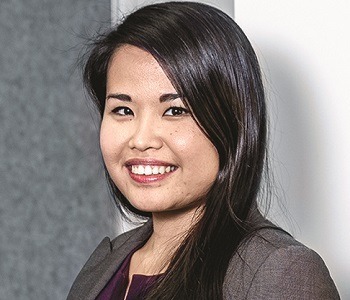 Although probably the youngest recipient, Carbon certainly hasn’t wasted any time in making her own impressive contributions to society, and for several years the corporate lawyer has been pouring considerable energies into the non-profit sector. Her achievements include being the co-founder of Charity-IT, an organisation that helps charities improve their IT systems through the use of IT expert professionals who volunteer their time, generally on a one-off basis. Carbon is also the co-founder of the blog, Business Is the New Black (BITNB), which aims to make more young women aware of, and interested in, entrepreneurship, science and technology by using fashion as a metaphor. She’s served as the President of AIESEC Canterbury, a local branch of the world’s largest student-run organisation, and is currently a mentor with the Asian Law Students Society at Victoria University. She’s also member of the Asia NZ Leadership Network which encourages young New Zealanders to help build New Zealand’s links through Asia, and has been selected to represent New Zealand in a selection of international conferences on youth and entrepreneurship. Carbon was born in the Philippines and migrated to New Zealand with her family in 1999. She says she’s always had an interest in law, and jokes that television shows like Boston Legal further instilled this. She’s proof that working as a corporate lawyer and being active in the not-for-profit world can - and do - go hand-in-hand. “When I went to university I knew I wanted to do law and political science. My interest in commercial law started with a couple of papers at uni,” she says. Charity-IT is a concept that is quickly growing in prominence and has already proven very successful for the charities it supports. It sees charities/non-profit organisations and IT professionals come together over a weekend to overcome small challenges through IT, which can make a big difference in the day to day activities of these organisations. The idea evolved after Carbon put several years into working in the non-profit sector with a variety of different organisations and realised the frustration of just how limited the resources are for charities. Within that, IT is often the last thing that people think to put money into, she says. When Carbon was announced as the award winner in the Emerging Leader category, the judge, Jamie Fitzgerald, emphasised that her "commitment to not just her own impressive personal achievements, but also to the performance of others was very hard to match by anyone at any age." In particular her work as a role model to spur an interest among more young women in entrepreneurship, science and technology was highlighted. Carbon says she feels that women aren’t encouraged to think about these subjects, and from high school onwards the growing difference in numbers between women and men studying science and maths subjects becomes stark. She says she herself only “stumbled” upon the idea of entrepreneurship, thanks to a trip to India she won as a prize in an essay-writing competition in 2011. Carbon’s latest project, a blog called Business Is the New Black, tackles what she perceives to be this lack of females getting passionate about entrepreneurship, science and technology, by speaking to them using fashion as a metaphor to explain business concepts. Somehow, the young woman manages to juggle all of this extra-curricular non-profit work with the day-to-day intensity that comes with being a lawyer. She insists she’s nothing special – you simply find time to do the things you’re passionate about, she says, -adding that she has a very supportive and flexible workplace in Chapman Tripp. Carbon admits that it can be a particularly challenging for young female lawyers to have the self-confidence to back themselves in a tough environment, especially if they don’t have many women role models.